The major distinguishing characteristic of cations is their positive charge. Just like a magnet, a positive charge is strongly attracted to a negative charge. When soil particles have a negative charge, the particles attract and retain cations. These soils are said the have a cation exchange capacity. Although most soils are negatively charged and attract cations, some Hawaii soils are exceptions as we will see. * Unlike the other base cations, sodium is not an essential element for all plants. Soils that contain high levels of sodium can develop salinity and sodicity problems. The words ‘base’ and ‘acid’ refer to the particular cation’s influence on soil pH. As you might suspect, a soil with a lot of acid cations held by soil particles will have a low pH. In contrast, a highly alkaline soil predominately consists of base cations. Cations in the soil compete with one another for a spot on the cation exchange capacity. However, some cations are attracted and held more strongly than other cations. In decreasing holding strength, the order with which cations are held by the soil particles follows: aluminum, hydrogen, calcium, potassium and nitrate, and sodium. Figure 2. CEC values of various soil type, media, and minerals. Soils which have high amounts of organic matter and moderately weathered clays tend to have high CECs. As soils become highly weathered, the CEC of the soil decreases. Sandy soils, too, generally have lower CEC values. This is due to the lesser surface of sandy particles in comparison with clay minerals, which decreases the ability of sand particles to hold and retain nutrients. Source: Brady and Weil. 2002. Elements of the Nature and Properties of Soil. Prentice Hall, New Jersey. In the tropics, many highly weathered soils can have an anion exchange capacity. This means that the soil will attract and retain anions, rather than cations. In contrast to cations, anions are negatively charged. The anions held and retained by soil particles include phosphate, sulfate, nitrate and chlorine (in order of decreasing strength). In comparison to soils with cation exchange capacity, soils with an anion capacity have net positive charge. Soils that have an anion exchange capacity typically contain weathered kaolin minerals, iron and aluminum oxides, and amorphous materials. 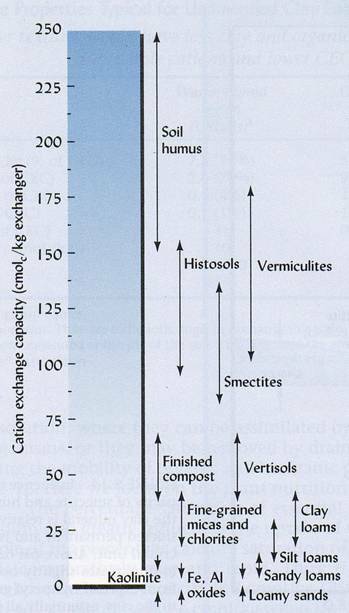 Anion exchange capacity is dependent upon the pH of the soil and increases as the pH of the soil decreases. Base saturation is a measurement that indicates the relative amounts of base cations in the soil. By definition, it is the percentage of calcium, magnesium, potassium and sodium cations that make up the total cation exchange capacity. For example, a base saturation of 25 % means that 25 % of the cation exchange capacity is occupied by the base cations. If the soil does not exhibit an anion exchange capacity, the remainder 75 % of the CEC will be occupied by acid cations, such as hydrogen and aluminum. Generally, the base saturation is relatively high in moderately weathered soils that formed from basic igneous rocks, such as the basalts of Hawaii. The pH of soil increases as base saturation increases. In contrast, highly weathered and/or acidic soils tend to have low base saturation. There are three basic methods in which nutrients make contact with the root surface for plant uptake. They are root interception, mass flow, and diffusion. Root interception: Root interception occurs when a nutrient comes into physical contact with the root surface. As a general rule, the occurrence of root interception increases as the root surface area and mass increases, thus enabling the plant to explore a greater amount of soil. Root interception may be enhanced by mycorrhizal fungi, which colonize roots and increases root exploration into the soil. Root interception is responsible for an appreciable amount of calcium uptake, and some amounts of magnesium, zinc and manganese. Mass flow: Mass flow occurs when nutrients are transported to the surface of roots by the movement of water in the soil (i.e. percolation, transpiration, or evaporation). The rate of water flow governs the amount of nutrients that are transported to the root surface. Therefore, mass flow decreases are soil water decreases. Most of the nitrogen, calcium, magnesium, sulfur, copper, boron, manganese and molybdenum move to the root by mass flow. Diffusion: Diffusion is the movement of a particular nutrient along a concentration gradient. When there is a difference in concentration of a particular nutrient within the soil solution, the nutrient will move from an area of higher concentration to an area of lower concentration. You may have observed the phenomenon of diffusion when adding sugar to water. As the sugar dissolves, it moves through parts of the water with lower sugar concentration until it is evenly distributed, or uniformly concentrated. Diffusion delivers appreciable amounts of phosphorus, potassium, zinc, and iron to the root surface. Diffusion is a relatively slow process compared to the mass flow of nutrients with water movement toward the root. Before both water and nutrients are incorporated into plants, both must first be absorbed by plant roots. Root hairs, along with the rest of the root surface, are the major sites of water and nutrient uptake. Water moves into the root through osmosis and capillary action. Soil water contains dissolved particles, such as plant nutrients. These dissolved particles within soil water are referred to as solute. Osmosis is the movement of soil water from areas of low solute concentration to areas of high solute concentration. Osmosis is essentially the diffusion of soil water. Capillary action results from water’s adhesive (attraction to solid surfaces) and cohesion (attraction to other water molecules). Capillary action enables water to move upwards, against the force of gravity, into the plant water from the surrounding soil. Nutrient ions move into the plant root by diffusion and cation exchange. Diffusion is the movement of ions along a high to low concentration gradient. Once water and nutrient ions enter the plant root, they move though spaces that exist within the root tissue between neighboring cells. Water and nutrients are then transported into the xylem, which conducts water and nutrients to all parts of the plant. Once water and nutrients enter the xylem, both can be transported to other parts in the plant where the water and nutrients are needed. The basic outline of how nutrient ions are absorbed by plant cells follows. permeable to oxygen, carbon dioxide, as well as certain compounds. selectively permeable to inorganic ions and organic compounds, such as amino acids and sugars. Passive transport is the diffusion of an ion along a concentration gradient. When the interior of the cell has a lower concentration of a specific nutrient than the outside of the cell, the nutrient can diffuse into the cell. This type of transport requires no energy. Active transport is the movement of a nutrient ion into the cell that occurs against a concentration gradient. Unlike passive transport, this type of movement requires energy. An important characteristic of some nutrients is the ability to move within the plant tissue. In general, when certain nutrients are deficient in the plant tissue, that nutrient is able translocate from older leaves to younger leaves where that nutrient is needed for growth. Nutrients with this ability are said to be mobile nutrients, and include nitrogen, phosphorus, potassium, magnesium, and molybdenum. In contrast, immobile nutrients do not have the ability to translocate from old to new growth. Immobile nutrients include calcium, sulfur, boron, copper, iron, manganese, and zinc. Nutrient mobility, or immobility, provides us with special clues when diagnosing deficiency symptoms. If the deficiency symptom appears first in the old growth, we know that the deficient nutrient is mobile. On the other hand, if the symptom appears in new growth, the deficient nutrient is immobile. Mobility of a nutrient within the soil is closely related to the chemical properties of the soil, such as CEC and AEC, as well as the soil conditions, such as moisture. When there is sufficient moisture in the soil for leaching to occur, the percolating water can carry dissolved nutrients which will be subsequently lost from the soil profile. The nutrients which are easily leached are usually those nutrients that are less strongly held by soil particles. For instance, in a soil with a high CEC and low AEC, nitrate (an anion) will leach much more readily than calcium (a cation). Additionally, in such a soil, potassium (a monovalent cation) will leach more readily than calcium (divalent cation) since calcium is more strongly held to the soil particles than potassium. Silica from minerals also dissolves and leaches from the soil profile during the processes of weathering. It is this dissolution and leaching that transforms primary minerals to the more weathered, secondary minerals that make up the finely-textured soils of Maui.